The dermatophytes are a group of fungi that invade and grow in the dead keratin of skin, hair, and nails. Dermatophytes are, by far, the most prevalent of the 3 major classes of superficial infections. 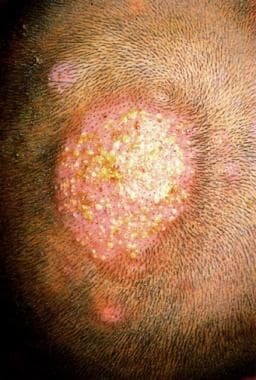 Less frequently, superficial skin infections are caused by nondermatophyte fungi (eg, Malassezia furfur in tinea versicolor) and Candida species. Several species of dermatophytes commonly invade human keratin, and these belong to the Epidermophyton, Microsporum, and Trichophyton genera. They tend to grow outwards on skin, producing a ringlike pattern, hence the term "ringworm". They are very common and affect different parts of the body. Clinically, dermatophytosis infections, also known as tinea, are classified according to the body regions involved. The type and severity of the host response is often related to the species and strain of the dermatophyte causing the infection. The dermatophytes are the only fungi that have evolved a dependency on human or animal infection for the survival and dissemination of their species. The infection may spread from person to person (anthropophilic), animal to person (zoophilic), or soil to person (geophilic). The most common of these organisms are Trichophyton rubrum, Trichophyton tonsurans, Trichophyton interdigitale and/or Trichophyton mentagrophytes, Microsporum canis, and Epidermophyton floccosum. Tinea capitis; gray patch ringworm. Gray patch refers to the scaling with lack of inflammation, as noted in this patient. Hairs in the involved areas assume a characteristic dull, grayish, discolored appearance and are broken and shorter. 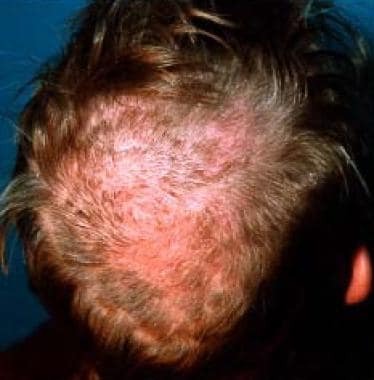 Tinea favosa of the scalp shows erythematous lesions with pityroid scaling. Some hairs are short and brittle. The specific etiologic agent is often associated with a specific region of infection. Further elaboration of the discussion below can be found in the tinea articles of the Medscape Reference Dermatology volume (Tinea Barbae, Tinea Capitis, Tinea Corporis, Tinea Cruris, Tinea Faciei, Tinea Nigra, Tinea Pedis, Tinea Versicolor). High prevalence rates of tinea pedis and onychomycosis have been linked to increased urbanization, community showers, sports, and the use of occlusive footwear. These factors are thought to contribute to the high prevalence of tinea pedis in certain occupational groups, including marathon runners (22-31% prevalence), miners (21-72.9% prevalence), and soldiers (16.4-58% prevalence). Several of these studies also found high rates of onychomycosis presenting with tinea pedis. Outbreaks of infections can occur in schools, households, and institutional settings. Although dermatophytes are found throughout the world, the most prevalent strains and the most common sites of infection vary by region. Hot, humid climates and overcrowding predispose populations to skin diseases, including tinea infections. Developing countries have high rates of tinea capitis, while developed countries have high rates of tinea pedis and onychomycosis. Low socioeconomic conditions are strongly linked to higher prevalence rates for skin infections, including tinea infections. A review of 18 studies representing large geographical areas determined that tinea capitis is present in up to 19.7% of the general population in developing countries. While mortality due to dermatophytes is very low, there is significant morbidity associated with these infections, particularly in the armed forces and active adults. Cellulitis in the lower extremities, which causes a breach in the skin and allows the inoculation of opportunistic bacteria, is a frequent complication of interdigital fungal infection. In patients with impaired cell-mediated immune function, atypical and locally aggressive presentations of dermatophyte infection may occur. These include extensive skin disease, subcutaneous abscesses, and dissemination. Fungal infection affects all races; however, the prevalence of organisms varies by country. Both sexes are affected by fungal infection. Tinea cruris is much more common in males because of the male anatomy, which allows moisture to accumulate in the crural folds. 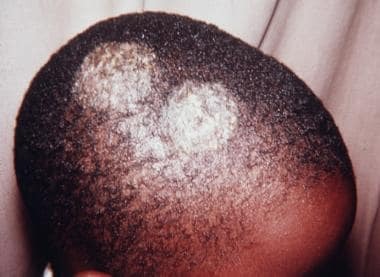 In the United States, tinea pedis is the most common in adults and tinea capitis is the most common in children. Tinea corporis is present in all ages, although it is more frequent in adolescents and pregnant females. Skin tinea infection generally resolves without sequelae within 1-2 weeks of therapy. Hair and nail tinea require 3-6 months of treatment. For excellent patient education resources, visit eMedicineHealth's Skin Conditions and Beauty Center. Also, see eMedicineHealth's patient education articles Ringworm on Body and Ringworm on Scalp. Cohn MS. Superficial fungal infections: topical and oral treatment of common types. Postgrad Med. 1992. 91:239-52. Zhu M, Li L, Wang J, Zhang C, Kang K, Zhang Q. Tinea Capitis in Southeastern China: A 16-Year Survey. Mycopathologia. 2009 Nov 21. [Medline]. Abdel-Rahman SM, Farrand N, Schuenemann E, et al. The prevalence of infections with Trichophyton tonsurans in schoolchildren: the CAPITIS study. Pediatrics. 2010 May. 125(5):966-73. [Medline]. Ameen M. Epidemiology of superficial fungal infections. Clin Dermatol. 2010 Mar 4. 28(2):197-201. [Medline]. Geddes ER, Rashid RM. 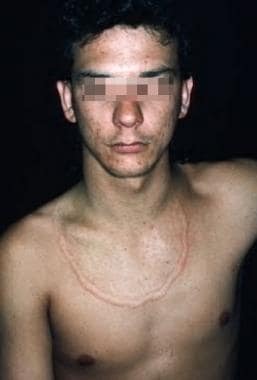 Delusional tinea: a novel subtype of delusional parasitosis. Dermatol Online J. 2008. 14(12):16. [Medline]. Del Boz J, Crespo V, Rivas-Ruiz F, de Troya M. Tinea incognito in children: 54 cases. Mycoses. 2009 Nov 26. [Medline]. Hryncewicz-Gwozdz A, Beck-Jendroschek V, Brasch J, Kalinowska K, Jagielski T. Tinea capitis and tinea corporis with a severe inflammatory response due to Trichophyton tonsurans. Acta Derm Venereol. 2011 Oct. 91(6):708-10. [Medline]. Gupta AK, Sauder DN, Shear NH. Antifungal agents: an overview. Part I. J Am Acad Dermatol. 1994 May. 30(5 Pt 1):677-98; quiz 698-700. [Medline]. Gupta AK, Sauder DN, Shear NH. Antifungal agents: an overview. Part II. J Am Acad Dermatol. 1994 Jun. 30(6):911-33; quiz 934-6. [Medline]. Singal A, Pandhi D, Agrawal S, et al. Comparative efficacy of topical 1% butenafine and 1% clotrimazole in tinea cruris and tinea corporis: a randomized, double-blind trial. J Dermatolog Treat. 2005. 16(5-6):331-5. [Medline]. Czaika VA. Effective treatment of tinea corporis due to Trichophyton mentagrophytes with combined isoconazole nitrate and diflucortolone valerate therapy. Mycoses. 2013 May. 56 Suppl 1:30-2. [Medline]. Friedrich M. Inflammatory tinea pedis with bacterial superinfection effectively treated with isoconazole nitrate and diflucortolone valerate combination therapy. Mycoses. 2013 May. 56 Suppl 1:23-5. [Medline]. Ali S, Graham TA, Forgie SE. The assessment and management of tinea capitis in children. Pediatr Emerg Care. 2007 Sep. 23(9):662-5; quiz 666-8. [Medline]. Arenas R, Toussaint S, Isa-Isa R. Kerion and dermatophytic granuloma. Mycological and histopathological findings in 19 children with inflammatory tinea capitis of the scalp. Int J Dermatol. 2006 Mar. 45(3):215-9. [Medline]. Avner S, Nir N, Henri T. Combination of oral terbinafine and topical ciclopirox compared to oral terbinafine for the treatment of onychomycosis. J Dermatolog Treat. 2005. 16(5-6):327-30. [Medline]. Bahamdan K, Mahfouz AA, Tallab T, et al. Skin diseases among adolescent boys in Abha, Saudi Arabia. Int J Dermatol. 1996 Jun. 35(6):405-7. [Medline]. Brodell RT, Elewski BE. Clinical pearl: systemic antifungal drugs and drug interactions. J Am Acad Dermatol. 1995 Aug. 33(2 Pt 1):259-60. [Medline]. Degreef HJ, DeDoncker PR. Current therapy of dermatophytosis. J Am Acad Dermatol. 1994 Sep. 31(3 Pt 2):S25-30. [Medline]. Derya A, Ilgen E, Metin E. Characteristics of sports-related dermatoses for different types of sports: a cross-sectional study. J Dermatol. 2005 Aug. 32(8):620-5. [Medline]. Devliotou-Panagiotidou D, Koussidou-Eremondi T, Badillet G. Dermatophytosis in northern Greece during the decade 1981-1990. Mycoses. 1995 Mar-Apr. 38(3-4):151-7. [Medline]. [Guideline] Drake LA, Dinehart SM, Farmer ER, et al. Guidelines of care for superficial mycotic infections of the skin: tinea capitis and tinea barbae. Guidelines/Outcomes Committee. American Academy of Dermatology. J Am Acad Dermatol. 1996 Feb. 34(2 Pt 1):290-4. [Medline]. [Guideline] Drake LA, Dinehart SM, Farmer ER, et al. Guidelines of care for superficial mycotic infections of the skin: tinea corporis, tinea cruris, tinea faciei, tinea manuum, and tinea pedis. Guidelines/Outcomes Committee. American Academy of Dermatology. J Am Acad Dermatol. 1996 Feb. 34(2 Pt 1):282-6. [Medline]. Elewski BE. Clinical diagnosis of common scalp disorders. J Investig Dermatol Symp Proc. 2005 Dec. 10(3):190-3. [Medline]. Elewski BE. The dermatophytoses. Semin Cutan Med Surg. 1996. 2:1043-55. Elewski BE. Tinea capitis: itraconazole in Trichophyton tonsurans infection. J Am Acad Dermatol. 1994 Jul. 31(1):65-7. [Medline]. Enweani IB, Ozan CC, Agbonlahor DE, et al. Dermatophytosis in schoolchildren in Ekpoma, Nigeria. Mycoses. 1996 Jul-Aug. 39(7-8):303-5. [Medline]. Gold DT, McClung B. Approaches to patient education: emphasizing the long-term value of compliance and persistence. Am J Med. 2006 Apr. 119(4 Suppl 1):S32-7. [Medline]. Gupta AK, Adam P, Dlova N, et al. Therapeutic options for the treatment of tinea capitis caused by Trichophyton species: griseofulvin versus the new oral antifungal agents, terbinafine, itraconazole, and fluconazole. Pediatr Dermatol. 2001 Sep-Oct. 18(5):433-8. [Medline]. Gupta AK, Sibbald RG, Lynde CW, et al. Onychomycosis in children: prevalence and treatment strategies. J Am Acad Dermatol. 1997 Mar. 36(3 Pt 1):395-402. [Medline]. Mahe A, Prual A, Konate M, et al. Skin diseases of children in Mali: a public health problem. Trans R Soc Trop Med Hyg. 1995 Sep-Oct. 89(5):467-70. [Medline]. Möhrenschlager M, Seidl HP, Ring J, et al. Pediatric tinea capitis: recognition and management. Am J Clin Dermatol. 2005. 6(4):203-13. [Medline]. Roberts DT. Prevalence of dermatophyte onychomycosis in the United Kingdom: results of an omnibus survey. Br J Dermatol. 1992 Feb. 126 Suppl 39:23-7. [Medline]. Satter EK. Tinea imbricata. Cutis. 2009 Apr. 83(4):188-91. [Medline]. Sohnle PG, Kirkpatrick CH. Epidermal proliferation in the defense against experimental cutaneous candidiasis. J Invest Dermatol. 1978 Mar. 70(3):130-3. [Medline]. Weitzman I, Summerbell RC. The dermatophytes. Clin Microbiol Rev. 1995 Apr. 8(2):240-59. [Medline]. Welsh O, Welsh E, Ocampo-Candiani J, et al. Dermatophytoses in monterrey, méxico. Mycoses. 2006 Mar. 49(2):119-23. [Medline]. Crawford F, Hollis S. Topical treatments for fungal infections of the skin and nails of the foot. Cochrane Database Syst Rev. 2007 Jul 18. CD001434. [Medline]. Seebacher C, Bouchara JP, Mignon B. Updates on the epidemiology of dermatophyte infections. Mycopathologia. 2008 Nov-Dec. 166 (5-6):335-52. [Medline]. Gupta AK, Cooper EA. Update in antifungal therapy of dermatophytosis. Mycopathologia. 2008 Nov-Dec. 166 (5-6):353-67. [Medline]. El-Gohary M, van Zuuren EJ, Fedorowicz Z, Burgess H, Doney L, Stuart B, et al. Topical antifungal treatments for tinea cruris and tinea corporis. Cochrane Database Syst Rev. 2014 Aug 4. 8:CD009992. [Medline]. Bell-Syer SE, Khan SM, Torgerson DJ. Oral treatments for fungal infections of the skin of the foot. Cochrane Database Syst Rev. 2012 Oct 17. 10:CD003584. [Medline]. Havlickova B, Czaika VA, Friedrich M. Epidemiological trends in skin mycoses worldwide. Mycoses. 2008 Sep. 51 Suppl 4:2-15. [Medline]. Table. Ecology of Common Human Dermatophyte Species. Table reprinted with permission from David Ellis, Bsc (Hons), MSc, PhD, FASM, FRCPA (Hon), Affiliate Associate Professor, The University of Adelaide (http://www.mycology.adelaide.edu.au/mycoses/cutaneous/dermatophytosis).